The Australian Government funding will grow to a record level of $243.5 billion from 2018 to 2027 for schools (Birmingham, 2018)1. This budget will implement many building developments. Specifiers should seize this opportunity to select the best door hardware for young Australians in educational facilities. The selection process can be difficult, as, over the years, the number of available door hardware options has increased. Brio's cutting-edge designs, fortunately, incorporate Simultaneous or Telescopic door hardware accessory kits. Developed to best suit the needs of educational facilities, both kits can be combined or used separately in conjunction with Brio's Single Run system to create a flexible space, partitioning off areas when required. What is a dynamic space and why is it important to have one? A space setting creates the stage for how one, works, studies and plays. Space is described as the 'body language' (Doorley and Witthoft, 2012)2 of an institution and when designed with intent, can contribute to high levels of success in the areas of collaboration, critical thinking, creativity and problem-solving. So, space matters, or does it? Arguments state that the move towards more agile learning spaces has gained momentum, not only in Australia but all around the world. Research has found that well-designed schools can boost children's academic performance. A study reveals that the physical elements of a classroom, including; light, temperature, air quality, ownership, flexibility, complexity and colour, together achieve a 16 per cent increase in academic progress over a learning year (Barrett et al., 2015)3. Without the right layout, many educational facilities often struggle to maximise space, hence it is important to have a good layout plan in the beginning stages of design. A vital element that makes a good school design are flexible spaces that can be zoned for various activity areas to help facilitate learning (Plotka, 2016)4. Traditional single classrooms are built with no partition panels making it difficult to create dual or multipurpose space for extra activities. How do Brio's Simultaneous or Telescopic accessory kits create a flexible space for Australian Educational facilities? 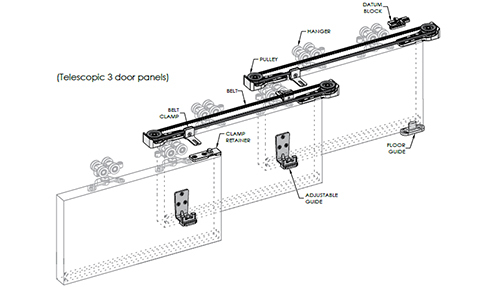 Brio's Simultaneous or Telescopic accessory kits complement top hung straight sliding door hardware, designed to fully integrate with Brio's Single Run system. A discrete hardware design, it does not require a bottom guide channel, allowing a clear passageway with no interruption when entering, eliminating tripping hazards and suitable for high traffic areas such as schools. The Simultaneous and Telescopic are two different types of hardware accessories, used in conjunction with the Single Run system. Suitable for both retrofit and new construction applications, they can be combined or applied separately. Opens bi-parting panels symmetrically. Operating one panel will drive the other panel to travel in the opposite direction at the same time. Opens passing panels concurrently. Operating one panel will drive the other panels to traverse across the opening. Open bi-parting passing panels in a staggered action. Operating one panel will drive the other panels to traverse in the opposite direction at the same time. Used separately or combined in a new construction application, when the door panels are open, they are concealed into the wall cavity pockets. This will achieve a large opening of up to 8.5m wide on a Telescopic system (separate or combined), a true aesthetic finish. Educational facilities can now have the flexibility to instantly change the layout of a learning environment, partitioning off areas for dual use when opening and closing door panels. Simultaneous open bi-parting panels symmetrically where the clamped pulley retains the toothed belt loop to the track. This loop is then fixed to both panels enabling them to move when hangers travel across the track. Operating one panel drives the other panel to travel in the opposite direction at the same time. Telescopic opens passing panels concurrently. Similar to Simultaneous, pulley brackets and toothed belts are used to operate panels. The toothed belt is looped individually on each panel, which is all connected to each other with the belt clamps. As the door gets pulled, those belts rotate to then pull the next panel which opens in a staggered action. Brio's Single Run System: A top hung straight sliding hardware system designed for interior and exterior sliding shutters and panels. For more information, visit www.brio.com.au. I would like to enquire about Brio.